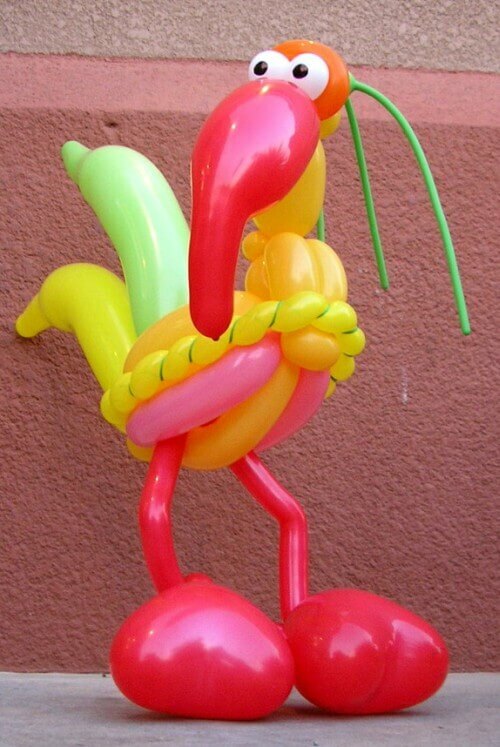 Wondering how to make balloon animals? Isn't it fascinating to watch how a long thin balloon "sausage" turns into one of those delicate, twisted creatures which delight kids and adults alike? With our tips, some practice and patience, you are well off to create your first balloon dog, bear or elephant. We are balloon decorators, ... and balloon twisting is a whole science of its own. So please take the following tips as what they are - some basic advice to get you started. At the end of this article, you will find some videos and links to more advanced instructions. The most frequently used balloons for making animals are the "160" and the "260". The balloon numbers come from the approximate size of the balloons: 1 or 2 inches in diameter, and 60 inches in length gives "160" or "260". Use only high-quality balloons when creating animals so they will not burst on you. They might cost a bit more, but in the end will save you money. Well known brands are Qualatex, Betallic and Sempertex. Instead of embarrassing yourself by trying to blow the balloons up by mouth, I would recommend to use a good hand pump. Dual action hand pumps inflate the balloon with both push and pull motion, achieving a fast result. If you have an electrical inflator, you can use that as well, of course. Never inflate the entire balloon, leave about three inches of a so-called tail at the end. This gives the pressurized air in the inflated part someplace to go while modelling your balloon. Always start at the end with the knot when you begin twisting the balloon so that the air can be moved down the balloon into the tail that you left. Make all of your twists in the same direction to keep them in place, and don't let go of them until you've "locked" them. More about this in the video below. It works better when you use one hand as your holding hand and the other for twisting. Hold the already twisted part and work your way down the free part. A softer balloon is easier to practice shapes on, so don't inflate your balloons fully when you are practicing. Keep your hands dry when modeling the balloons. Use talcum powder if necessary. Phew, that's a lot of theory. How about some practice now? With just a handful of twisting techniques, you can create most balloon animals or other shapes, such as flowers and swords. And he lifts the secret about how the air gets into the poodle's tail! Enjoy! Hungry to learn even more twists? The "Tulip Twist" shown in the next video is a bit more advanced than the basic techniques above. But Jeremy (the guy in the video) does a good job in explaining it. He also shows how to get a ball into your sausage balloon - pretty cool, so watch the video to the end. Hooked on balloon twisting? If you want to get more step-by-step instructions how to make balloon animals as well as other fancy shapes, I highly recommend that you subscribe to Michael Floyd's YouTube channel. He's got tons of balloon twisting tutorials, and publishes a new one every week. But wait! You'll need balloons and a pump first. Because you will only learn how to make balloon animals by doing it yourself. Watching alone is not enough. 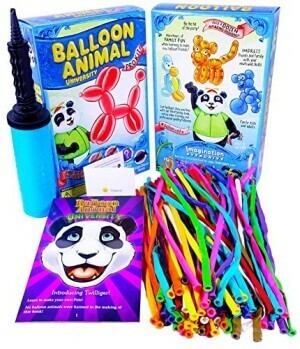 Balloon Animals Kit. Clicking the image will take you to Amazon. If you are just getting started, then this Balloon Animal Kit is a good idea. It contains 100 assorted color Qualatex twisting balloons, a dual action air pump, an instructional book and access to a whole online video series. Or browse through a selection of balloon twisting supplies.